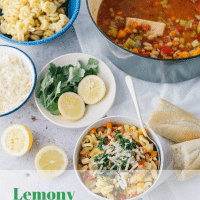 Lemony Vegetable Minestrone Soup // A citrusy vegetarian twist on the traditional minestrone soup. 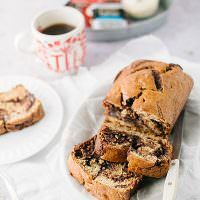 This can be made with ingredients you probably already have on hand. I love soup so much. My kids, not so much. Ava calls it “wet food”. Rude. I could eat soup every day. I love chopping the vegetables, the stirring, the simmering, the way my house smells, the whole thing. It is just as comforting for me to make a bowl of soup as it is to eat one. 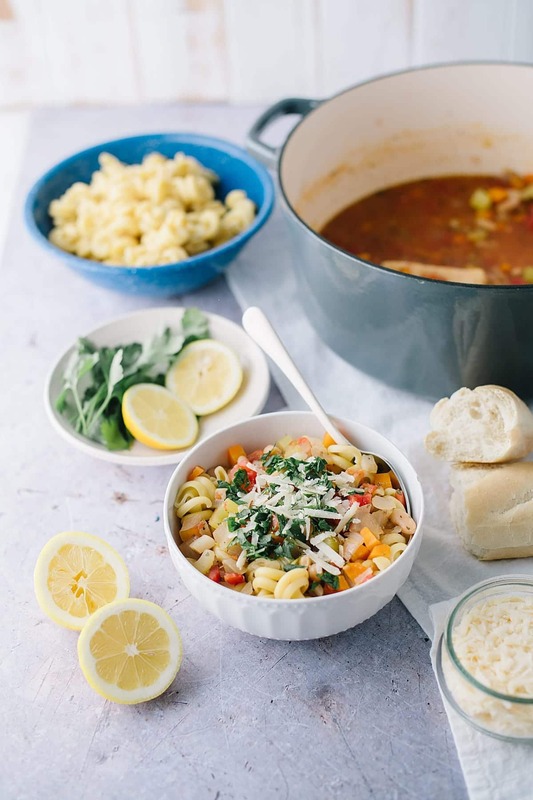 This version is a spin-off of minestrone soup that I have made many, many, times before. The recipe was given to me by my friend Alison she made it for us when we visited her and it was so delicious that I made it the day we returned home. And about a million times since then. The original recipe has sausage in it, you could still make this one with it and it would be great. But really, you don’t need it. It is filling and warm and comforting but also has some brightness from the lemon and parsley. For the kids, I’d add some shredded chicken or a rotisserie from the store. On the day that I photographed this, I was home alone. The kids were busy and not going to be home for dinner and Wes was on a work trip. I don’t usually make myself full pots of soup, but it was cold and snowy and I just felt like I needed something warm. 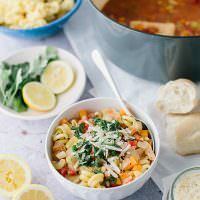 I used what I had in my fridge and pantry and I ate this soup for three days and didn’t get tired of it. I realize that it looks like a bowl of pasta with some broth ladled over it, and you would be right. I cook my pasta on the side (if you cook it in the soup, it absorbs the liquid and gets mushy if you try to reheat it) and put it in the bowl and ladle soup on top. 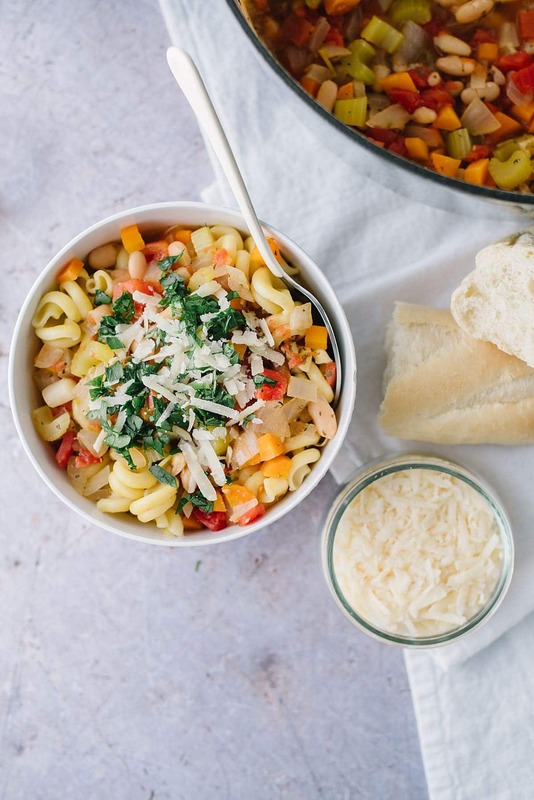 Let’s just say that this bowl was pasta aggressive, but that’s the beauty of making yourself a pot of soup, you can add as much pasta as you want. And no one was home to judge me. Add any veggies you have in the fridge. Peas, potatoes, zucchini, anything works. Have some leftover chicken? A rotisserie chicken? Throw it into the pot. 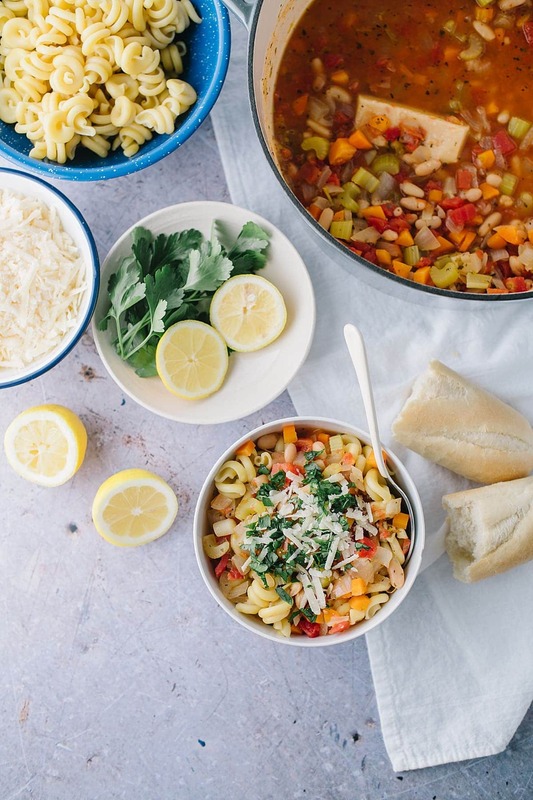 This soup tastes even better the next day. Just don’t add pasta to the pot. Heat oil in a Dutch Oven or large pot over medium heat. Add onions, carrots, and celery. Cook for 10 minutes, or until the vegetable soften. Add garlic, dried basil, oregano, salt, and pepper and cook for another minute. Add tomatoes and broth. Reduce heat to low and cook for another 20 minutes. Squeeze the juice of one lemon into the soup and add chopped parsley. Taste for seasoning. Add more lemon if you like. To serve, add cooked pasta to the bottom of a soup bowl. 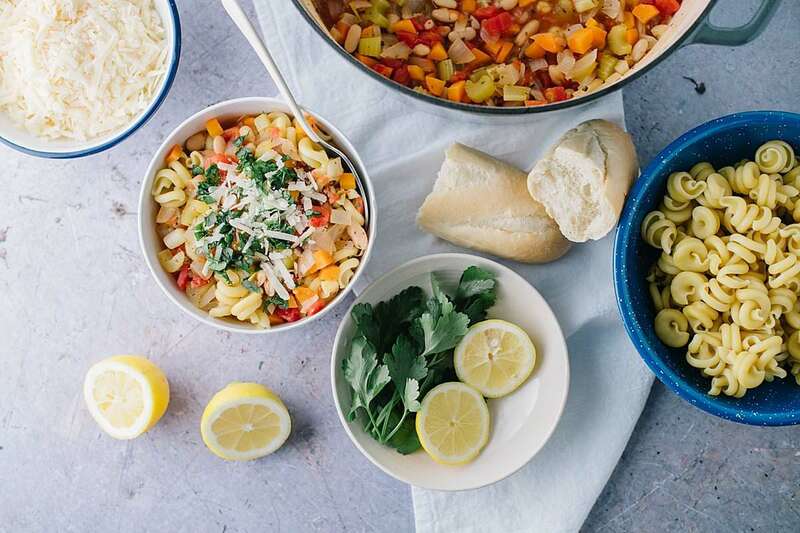 Ladle soup over and garnish with Parmesan and more parsley. Sitting here with a friend of mine who is raving about this soup she made last week! I can’t wait to try it!